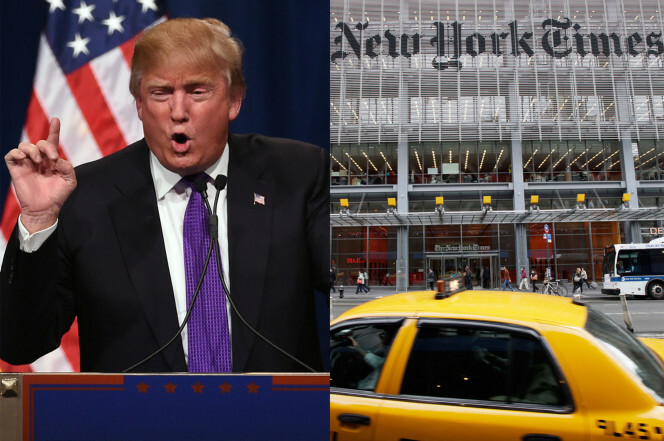 President Donald Trump called the New York Times (NYT) – the “Failing New York Times” in his press conference on Thursday and in his speech in Florida on Saturday. The President called the NYT ‘Failing’ for some time, including during his rallies when running for President. The President is right. The NYT is failing miserably and is in serious financial trouble. The NYT’s financials for 2016 show massive decreases in the bottom line (net income) for the 4th Quarter and for the year. The NYT’s 4th Quarter net income was $37m, down from $52m in the 4th Quarter of 2015 for a 28% decrease. The NYT’s annual 2016 results were worse at $29m versus $63m in 2015 for a year over year decrease of 54% . The Times blamed the poor results on a “pension settlement charge, lower print advertising revenues and higher costs”. 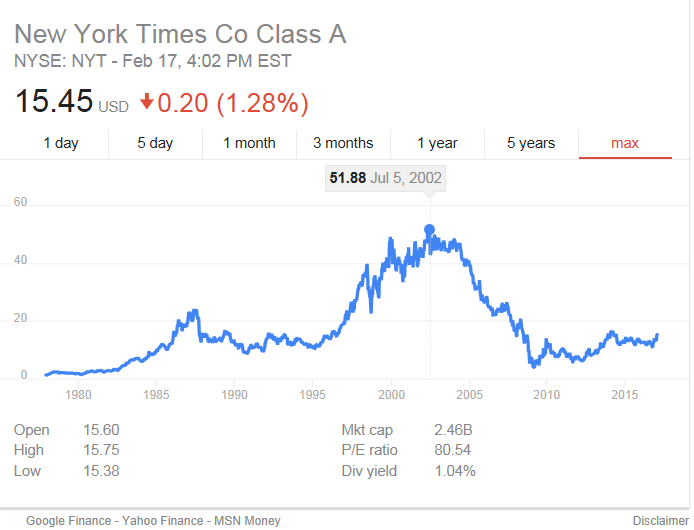 Although the NYT reported that their 4th Quarter digital subscriptions were their highest ever, at 276,000, their current business plan is not sustainable and they still succumbed to miserable results. The NYT has many problems. This liberal dinosaur employs roughly 3,500 down from 5,200 in 2012 and while the majority of companies in the US are watching their stocks reach new all time highs under the Trump Stock Market rally, the NYT’s stock price is at $15 down from nearly $52 per share in 2002. The more the NYT promotes questionable liberal news the further it falls into the abyss. The NYT paid for an ad on Twitter complaining that the Gateway Pundit (GWP) now has a reporter in the White House. While the NYT complains and spends money to promote the GWP being in the White House our numbers continue to set all time highs. 2016 was our best year ever! As the NYT heads towards bankruptcy promoting its anti-Trump agenda, it believes that it can charge fees for fake stories that can be easily obtained for free on the Internet. Their stories are not that good and are not that true. Their workforce is cumbersome and not well managed and as a result their numbers are tumbling in the wrong direction while the GWP and companies on the NYSE prosper. Their management would rather spend money for an ad on Twitter bashing the Gateway Pundit than spend efforts producing quality stories that increase readership. Socialist publications just don’t understand that they need to make a profit to continue to publish and Americans are turned off by liberal bias!